Happy Days Gone By: Time Travelers! American Graffiti (1973) was about the last day of summer 1962. A similar nostalgia film releasing in 2018 would have to be about those, lazy, crazy, hazy days of …2007. The start of the Korean War (1950) was 22 years before the start of the TV series M*A*S*H, meaning the Gulf War’s beginning in 1990 is significantly further away from today — by six years. Seinfeld debuted 30 years ago this coming January. It aired its final episode 20 years ago this past May. Watching reruns of Seinfeld in 2018 is comparable to watching reruns of I Love Lucy in the 1980s — that's how antique it is. Friends debuted in 1994, or 24 years ago. Watching reruns today would be like watching Tbe Brady Bunch … in 1993. In other words, we should be less than two years away from a whacky The Friends Movie a la The Brady Bunch Movie, which arrived 26 years after the original series first aired. Wanna feel old(er)? Movies that turned 20 this year include Saving Private Ryan, Armageddon, There’s Something About Mary, Wild Things and You’ve Got Mail. Fifties darling Connie Francis’s last Top 10 hit was “V-A-C-A-T-I-O-N” in 1962. She was 23 at the time of its release. She turns 80 this year. Sixties darling Diana Ross’s last Top 10 hit was “Missing You” in 1984. She was 40 when it was released. She turned 74 this year. Seventies darling Olivia Newton-John’s last Top 10 hit was “Twist of Fate” in 1983. She was 35 at the time of its release. She turns 70 this year. Eighties darling Madonna’s last Top 10 hit was “Gimme All Your Luvin’” in 2012. She was 53 at the time of its release. She turned 60 this year. 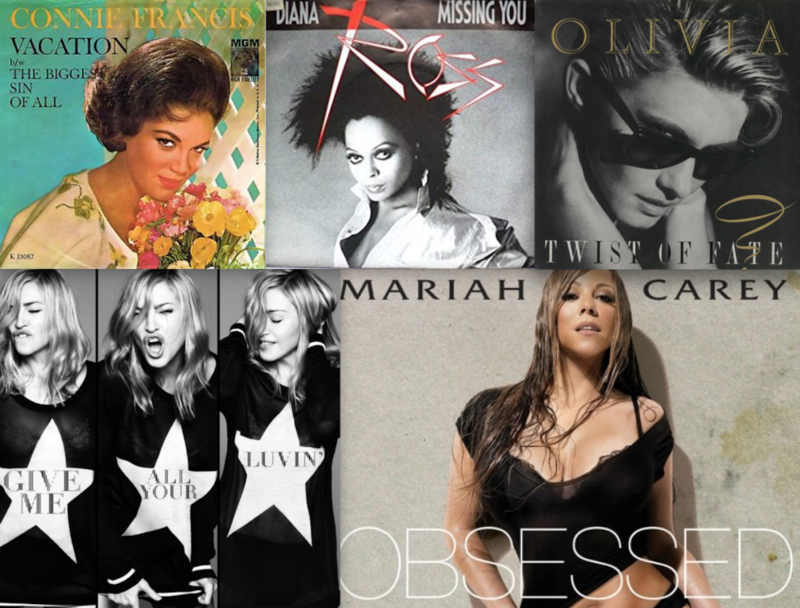 Nineties darling Mariah Carey’s last Top 10 hit was “Obsessed” in 2009. She was 39 at the time of its release. She turned 48 this year. Aretha Franklin, the Beatles, the Rolling Stones, the Monkees and the Supremes were to the ‘80s what Brandy, Britney Spears, Christina Aguilera, the Backstreet Boys and *NSYNC are to 2018. I'm a Madonna fanatic, and I think she is a wonderful human calendar for those obsessed with aging, in that she has been working for decades and yet is still very much Topic A any time she puts out a record — or an Instagram post. Carrie Underwood was born the year Madonna was released — 1983. Avril Lavigne was born the year Like a Virgin was released — 1984. Lady Gaga was born the year True Blue was released — 1986. Taylor Swift, duh, was born the year Like a Prayer was released — 1989. Rita Ora was born the year I'm Breathless was released — 1990. Demi Lovato was born the year Erotica was released — 1992. Harry Styles was born the year Bedtime Stories was released — 1994. Shawn Mendes was born the year Ray of Light was released — 1998. Willow Smith was born the year Music was released — 2000. Quvenzhané Wallis was born the year American Life was released — 2003. ... and why don't we let those born the same years as Madonna's later albums grow up a bit first. Speaking of waiting, had Madonna and Sean Penn taken their time and made it work, they would have celebrated their 33rd wedding anniversary this year. The time that elapsed between the release of Madonna’s eponymous first album (July 27, 1983) and the release of her critically acclaimed Like a Prayer album (March 21, 1989) is about the same amount of time that has elapsed between the end of her MDNA Tour (December 22, 2012) and now.